This is a great headline, as I will probably have to head down to my local Borders to pick up a copy. 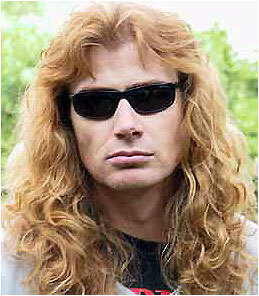 To me, Mustaine is probably the best spokesperson for Metal and the role it has played over the last 20 years. Plus his off beat humor and political opinions are quite entertaining. I talked to the Clear Channel people again last week and we are ready to go. We are going to do the first show from the Clear Channel station in San Diego, and I will hopefully be able to do an interview for the local San Diego Clear Channel Rock Channel. After that, I will determine what I need to make my studio ready to do the show. I am going to play music I like, music that influenced me, and “zingers” – which are songs that you would never know that I liked (like The Beatles, or stuff like the Dead Kennedy’s). I am going to collect all of your suggestions for some bands and songs , and we are going to start the show before I leave for New Zealand . I am also going to interview people from the bands that I meet or am on tour with, and I will try to do things like interview other celebs from other walks of life that like metal. I also will have a small part of the show feature a close friend and great radio personality from over the pond that came here and was rocking until his station got changed to a talk radio show or some crap like that and he ended up going back over seas. We talked about him sending a UK/Euro show over each week, or so, and we are good to go. It will take time, but we are getting ready to start. I still have to come up with a name for the show, and I still haven’t chosen a name for my autobiography. Any ideas? Lastly, just because I want 100,000 listeners, doesn’t mean that is a reality in the beginning. I will have the best show in metal, because I am going to listen to you. On a personal note, I had a good day today, went to service, then to the beach, then did a 1 1/2 hour Yoga X program. I am getting ready for bed now, and will do some reading before I go to bed, and get ready for a busy week of trying to take care of all the things I need to tackle before we leave for down under. This should be good…I’ve always been interested in Mustaine’s take on metal or music in general. He’s controversial at times, just to be controversial, but overall he has a unique take on most things.